Below you will find the hello world console app code to talk to xConnect. You pass it a thumbprint and a url and it will try to initialize a connection. The only issue is that with a normal old school console app I connect fine. But in a Core app I get the dreaded The HTTP response was not successful: Unauthorized error. Exact same code. Both in the same admin command prompt. I would not think so, but does core run in an alternate context? If I disable the cert in xConnect, the connect works. So it is definitely that core cannot process the cert properly. I have added code where I reach in the certificate registry and pull the cert, to test permissions and receive no errors on access. @" \$$   \$$  \$$$$$$   \$$$$$$  \$$   \$$ \$$   \$$  \$$$$$$$  \$$$$$$$    \$$$$ "
I got back info from Sitecore support on this. .netCore has different requirements for approved certificates that .NET does. 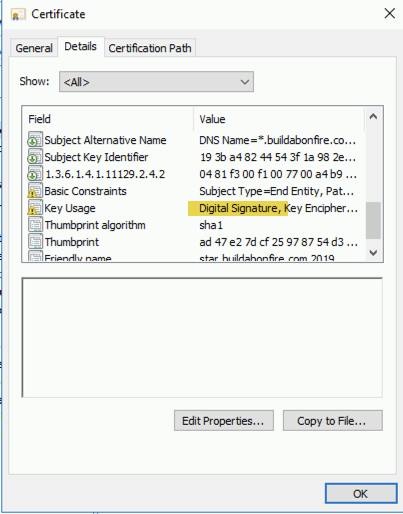 Core requires that the certificate have a "Key Usage" with a value or Digital Signature. You also have to locate this certificate to the personal certificate store on the local user. Not the local machine. This mean you have to have the cert in the Machine local store and Personal local store. Find a certificate that has key usage = Digital Signature. Update the thumbprint in the xConnect /App_Config/AppSettings.config with this new certificate. Alternately and not recommended, you can rem out the thumbprint setting in the xConnect /App_Config/AppSettings.config.